If you have hemlocks in your yard, you probably already know of the Hemlock Woody Adelgid (HWA). This tiny aphid-like insect has been attacking and killing hemlocks throughout the eastern United States. The devastation it causes makes it #3 in our countdown of Most Unwanted Landscape Pests. Both the Carolina Hemlock and the Eastern Hemlock are victimized by the Hemlock Wooly Adelgid. This insect doesn’t restrict itself to weak or stressed trees – healthy trees can be infested as well. Although a tree can survive an attack from the HWA, continued infestation is deadly, robbing the tree of the needles necessary for survival. There are no preventive measures for HWA; hemlocks should be inspected frequently for signs of infestation. You aren't likely to see the adelgids: they are so tiny they are almost imperceptible. But the signs of their presence are unmistakable: little dots of cotton appear along the base of the needles where they meet the wood. These cottony blobs are protecting the HWA eggs. When the crawlers emerge, they will latch on at the base of a needle and start draining the hemlock of its vital fluids. Obviously, a single adelgid doesn’t drink much; but as the population grows, the cottony balls extend along every branch, harboring millions of thirsty adelgids. 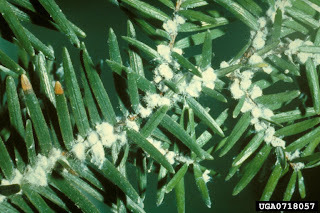 Within a few years of infestation, the hemlock is usually dead. Some of our beautiful, native hemlock forests have disappeared because of this foreign invader. Fortunately, this is an insect that we can successfully battle. Both foliar sprays and systemic controls are available that can give us the upper hand against these insects. There are several factors that should be considered in order to determine the best course of treatment, such as the size of the tree, the extent of infestation, soil and weather conditions and proximity to streams or ponds. 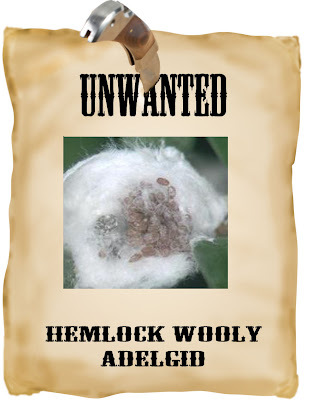 Your Almstead arborist will evaluate how these factors impact your hemlock and propose a method for combating these evil adelgids. In the future, there may be biological controls for HWA. Currently, experiments with predatory insects and fungi look promising, especially for forests where the cost of treating individual trees is impractical. For now, careful monitoring and early action are the best safeguards against Hemlock Woody Adelgid.